Mount Angel one-of-a-kind shop offers authentic German merchandise that reflects the city's Bavarian heritage. For a touch of Bavaria, one only has to go to Mount Angel. Mount Angel is no longer limited to quaint Bavarian building facades, food and festivals, but it also has a gift shop with a focus on Bavarian clothing. 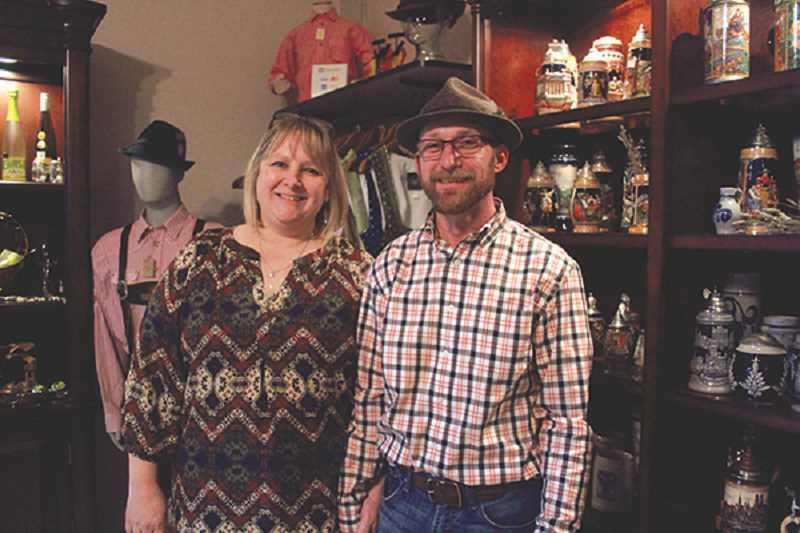 Touch of Bavaria has been at 110 Sheridan St. for a year now, located in its own section of Louie's Corner Gift Shop at the century-old Weissenfels blacksmith shop. But the small business operated out of owners Scott and Kristi Stokley's home for eight years. "We have a spare bedroom now; we can actually have guests," Kristi laughed. The business started when Scott Stokley was on a personal quest to find lederhosen for Oktoberfest. "There was nowhere local where I could try them on," he lamented, noting that it was only available online. So he hatched the plan to create a one-of-a-kind business venture by importing authentic German outfits and selling them locally. "I thought he was out of his mind," Kristi Stokley admitted. It was after Oktoberfest when they got started, but the following weekend was the Portland Oktoberfest at Oaks Park. "The event manager there asked me if I knew anyone who sold lederhosen," Scott said. And that's how he got his foot in the door. "We've grown every year," Kristi said, noting that they even have wine tastings once in a while. Soon, dirndls (women's Bavarian dresses) were added to the supply, and the variety kept growing. Today, Touch of Bavaria has moved beyond clothing and offers collectible items like beer steins and even imported wine from Germany. "It's named Touch of Bavaria because most everything — if not everything — is from Germany," Scott said. "There's not a store like this on the West Coast, so we're pretty unique." Having an expanded space that didn't take up space at home, plus added a changing room area, started to be necessary. Having already had a good relationship with Louie's Corner Gift Shop, which is run by Weissenfels descendants, the Stokley's were offered to use space that could accommodate shelves and racks for their merchandise and had enough room to build a couple fitting rooms. It was around Wurstfest when the painting and stocking was done. "We thought, hey, March 4 is our anniversary, that's as good a day as any to open, so why not," Kristi said. The stresses of owning a business (on top of working another full-time job, at least for Scott) are outweighed by the connections the Stokleys have made across the country. "It can get stressful but we try to have fun with it," Scott said. "It's a business but it's relationships. We've met tons of super nice people who we can now call friends." While finding the perfect Oktoberfest outfit isn't exactly cheap (though the business does have a pre-owned program, particularly for families), it's the warm customer service that makes customers keep coming back. "One of the benefits is you get to try it on before you buy it," Kristi said. "People want authentic (clothes), they want the real deal. We don't want you spend all that money and have buyer's remorse. We have repeat customers because of that investment." Having been opened in its new location for just over a year, plans to expand are ever-present. The partnership with Louie's could also allow future expansion for selling more goods or even expanding the wine section. "We want this to be a destination stop," Scott said. "It's always rolling through our heads what we could do next. Anything's possible." Hours are 11 a.m. to 5 p.m. Thursday through Saturday and 1 to 5 p.m. Sunday, possibly expanding after Memorial Day.